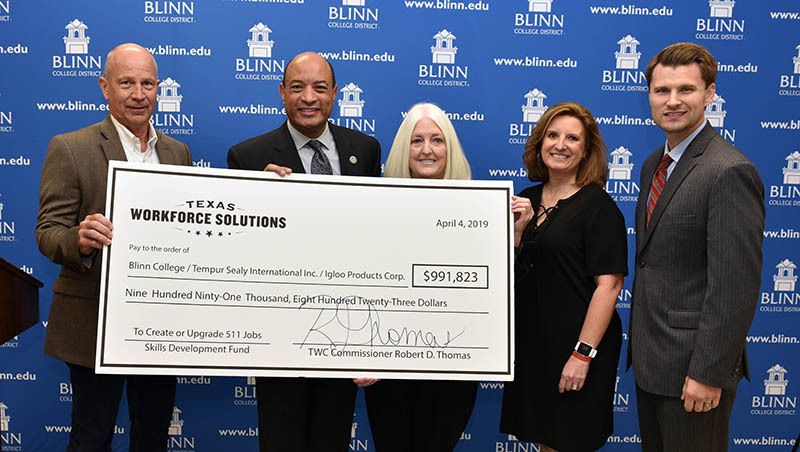 Texas Workforce Commission has awarded the Blinn College District a Skills Development Fund grant worth almost $1 million to provide safety and skills training for 511 Tempur Sealy, Inc. and Igloo Products Corp. employees. The $991,823 grant will upgrade 424 positions and create 87 new jobs at the two companies. Texas Workforce Commissioner Representing the Public Robert Thomas made the announcement at Blinn’s A.W. Hodde, Jr. Technical Education Center in Brenham alongside Blinn College District Chancellor Dr. Mary Hensley, Blinn College Vice Chancellor for Public Affairs and Strategic Relations Leighton Schubert, Tempur Sealy Plant Manager Roy Finke, and Igloo Vice President of Human Resources Christine Brinkley. Blinn will provide training in 58 different courses, including electrical troubleshooting, mechatronics, process technology, powered industrial truck operation, precision measurement and thread gauging, lockout/tagout, manufacturing safety, the U.S. Occupational Safety and Health Administration 10- and 30-hour certifications, project management, communication, and leadership. Igloo Products Corp. is a Texas-based international designer, manufacturer and marketer of coolers and other outdoor products and housewares. Founded in 1947, Igloo originated the cooler category and remains the number one cooler brand worldwide. For more than 72 years, the Igloo brand has been synonymous with quality, durability and innovation. Offering more than 500 different products, Igloo coolers are sold by more than 110,000 retailer storefronts around the world. Temper Sealy International, Inc. develops, manufactures, and markets mattresses, foundations, pillows, and other products. The company’s products are sold worldwide through third-party retailers, its own stores, and online. Tempur Sealy’s brand portfolio includes many highly recognized brands in the industry, including Tempur®, Tempur-Pedic®, Sealy® featuring Posturepedic® technology, and Stearns & Foster®. The Skills Development Fund provides local, customized training opportunities for Texas businesses and workers to increase skill levels and wages of the Texas workforce. Blinn has secured millions of dollars in Skills Development Fund grants to help local employers such as Axis Pipe & Tube, Blue Bell, FUJIFILM Diosynth Biotechnologies, Igloo, Kaemark, Kent Moore Cabinets, NOV Grant Prideco, Stanpac, and Tempur Sealy develop and implement employee safety and skills training programs. Businesses, consortiums and trade unions with more than 100 employees are encouraged to contact the College at 979-209-7205 to explore partnering with Blinn for Skills Development Fund training opportunities. Businesses with fewer than 100 employees may be eligible for Skills for Small Business grants, and also are encouraged to contact Blinn for more information. Blinn strengthens the economy by helping job-seekers obtain the skills and credentials they need to succeed in the workplace, and by partnering with local businesses to offer training opportunities for incumbent and new employees. For more information on Blinn’s technical and community education programs, including class schedules and registration information, visit www.blinn.edu/workforce.